After long anticipation, Samsung S8 is here. And it is notable that Samsung’s latest smartphones are really astonishing devices with new amazing design. 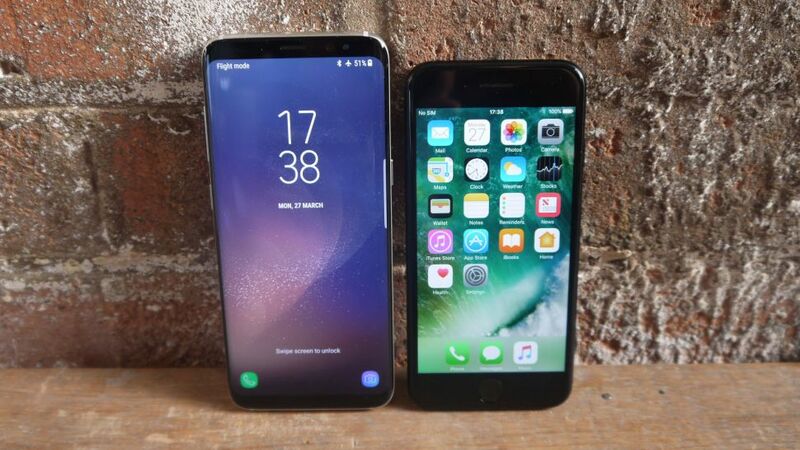 So, in case you are planning to buy a new smartphone, I prepared an apples to apples comparison tables between Samsung S8 vs iPhone 7 and Samsung Galaxy S8+ Plus vs iPhone 7 plus, in order to take your decision smoothly. Comparison will cover all technical specs, display, networks, body, display, memory, camera, battery and much more. Samsung Galaxy S8 / S8+ plus have metal frame, glass back and curved sides screen with dimensions (148.9 x 68.1 x 8 mm) for Samsung Galaxy S8 and (138.3 x 67.1 x 7.1 mm ) for Samsung Galaxy S8+. While iPhone 7 / 7 plus have premium quality and superior design with metal body and back. Dimensions for both devices are (138.3 x 67.1 x 7.1 mm) and (158.2 x 77.9 x 7.3 mm) respectively. Anyway let’s dive in the comparison between the four giant smartphone across the market.